Manufacturer Custom Covers has invested in a new high frequency welding machine , increasing PVC production capacity ahead of an expected spike in orders as tent suppliers confirm additional contracts in the run up to the Olympics. "Our turnover bounced 14% off the 2009 lows in 2010, and we felt confident enough to invest in a new machine increasing capacity by 20% " chief executive Robert Sanders tells Access. "We're ready to supply our clients with whatever they need". The Company introduced three new products at the Showman's Show in October. The first, a curved roof beam, works with existing components to extend a 3m wide structure to 6m, a 6m to a 9m, and a 9m to a 12m. 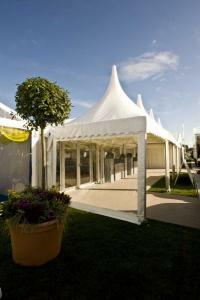 The Romsey and Whiteley pagodas, meanwhile are designed to work with Custom Covers' stock 9m frame legs and PVC walls. "Were selling conversion kits " Sanders adds. "Anybody who uses our system can build these new features in to add entrances or focal points at minimal extra cost."